NCHRP 350 compliant for a 48″ x 48″ or smaller signs. Corrosion resistant heavy-duty galvanized tubing. Built in 3-flag holder for ¾” wood dowel flags. 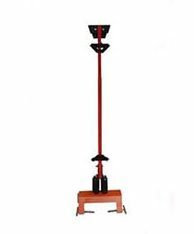 Stable in winding conditions, includes ballasting hook for sand bags or weights for added stability. NCHRP-350 compliant with roll-up signs and plastic Safe-Sign 350. Approved for roll up, plywood (48″ 5/8″), aluminum (.080, .100 and .125), when used with Safe Sleeve 350. Step-n-Drop leg feature enables quick set up. 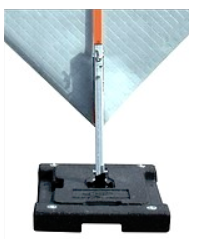 Dual springs are designed to hold 30″, 36″ and 48″ aluminum, wood or roll up signs in high wind conditions. All steel construction with powder coated paint to resist rusting. Rigid signs can achieve bottom heights of 12-18″. Roll Up signs can achieve bottom heights of 12″-5’. 2 position leg adjustment allows for set up on uneven terrain. 24000-BRU Roll up sign bracket available for additional cost. RU7-optional inner mast (will allow roll up signs to reach a bottom height of 7’) available for additional cost. Duel springs are designed to hold 30″, 36″ and 48″ aluminum, wood or roll up signs in high wind conditions. 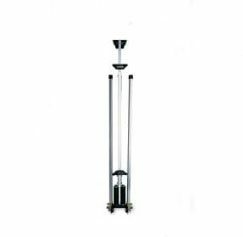 The legs and telescoping mast are made of lightweight aluminum to reduce carrying weight. Rigid signs can achieve bottom heights of 12″ to 5’ and roll up signs can achieve bottom heights of 12″ to 7’. NCHRP-350 approved for rigid, roll up and plastic signs at 5’ bottom height. Alternative to plywood and aluminum signs. Specialized corrugated plastic that is lightweight yet rigid. Durable powder coated steel clamp with heavy duty T-pins and hardened steel points. 12″ clamp fits 5 ½” – 12″ wide Jersey-style concrete barrier. 15″ clamp fits 8 ½” – 15″ wide Jersey-style concrete barrier. 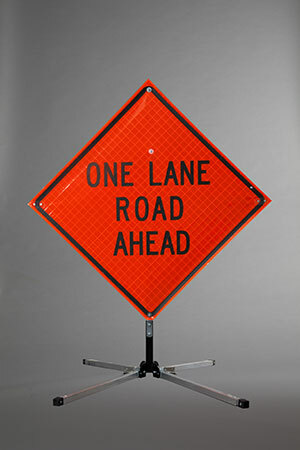 Safely displays 48″ x 48″ or smaller rigid and roll up signs. 36″ or 48″ inch signs. 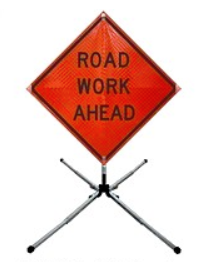 Road Work Ahead, One Lane Road Ahead, Flagger Symbol and Be Prepared To Stop legends in stock for 36″ signs. All other legends available per request for both 36″ and 48″ signs. For 36″ and 48″ roll up signs. 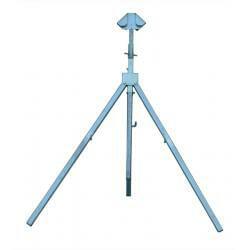 Aluminum telescoping legs from 30″ to 51″ for great stability. Recycled rubber base comes in 43lb or 49lb weights. Low profile base is great for limited display areas. NCHRP 350 complaint for 2-lane and 4-lane highways, up to 65 mph wind conditions for a 36″ sign and up to 50 mph for a 48″ sign. NCHRP 350 compliant for 2-lane and 4-lane highways. Economical, rugged stand for 36″ or 48″ sign. Approved for plywood, aluminum, roll-up, and other sign substrates. Easily weighted for added stability with 48″ sign. NCHRP 350 compliant for 2-lane and 4-lane highways, up to 70 mph wind conditions for a 36″ or 48″ sign. Displays rigid or roll-up signs at 15″ minimum above grade. Approved for plywood, aluminum, roll-up, and all other sign substrates. Work Quick – Work Safe in high-risk zones. Fits concrete barriers from 6-15 feet wide.